Careers at Elio’s Foot Comfort Centre. 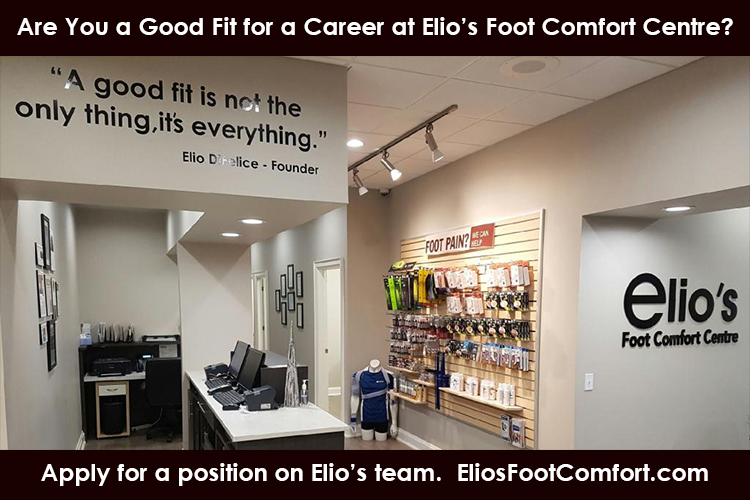 Step up with a career as a Chiropodist, Pedorthist, Lab Technician, or other employment in the foot health care sector with an opportunity at Elio’s Foot Comfort Centre in Thorold, Ontario. As an expanding business with an exciting future, Elio’s requires a talented team. If you are a lifetime achiever, energetic, show a strong work ethic, dedicated to customer service, and have experience in retail footwear business or foot health care, then submit your resume to us. Elio’s Foot Comfort Centre, the business that makes feet happy, has been continually taking steps forward. Since 1970, Elio’s has always continued to evolve. Located in the Pine Shopping Centre, 9 Pine Street North, Thorold, Elio’s puts a strong focus on customer satisfaction. Elio’s is a member of the Pedorthic Association of Canada. Today, people from all over the Niagara region travel to Elio’s for a premium selection of footwear by some of the world’s top brand names. Some customers from distant places in Southern Ontario turn to Elio’s for unique solutions to their foot pain. Visit Elio’s in the Pine Shopping Centre, 9 Pine Street North, Thorold. Free parking is available. Contact us today and submit your cover letter and resume for a career opportunity at Elio’s.